Subway service resumed Thursday morning after a water main break in Greenwich Village flooded streets and sent water cascading down into a station below, halting trains for hours and forcing officials to evacuate hundreds of straphangers stuck in disabled cars. Service on the 1 and 2 lines resumed early Thursday following the break at 13th Street and Seventh Hour. The FDNY says said a Con Edison crew working on a separate utility issue may have struck a water pipe at the intersection, causing the 12-inch break. Water could be seen falling down into the 14th Street station on the IRT Broadway - Seventh Avenue Line, flooding the tracks and halting 1, 2 and 3 trains between Chambers Street and 42nd Street - Times Square. Battalion Chief John Porretto said the station flooded with about a foot and a half of water, and MTA crews were working on draining the station with pumps. "Water was just pouring down in sheets on to the 1 track," said Anne Dantzler, who was arriving on the northbound 2 train when she saw the station getting flooded. "Just sheets and sheets of water, it was really loud." About 500 passengers had to be removed from trains that got stuck in the waters, Porretto said. No one was hurt. The water main break initially affected service on all three of the lines. The MTA says the third rail on the local tracks at the station was submerged under several feet of water following the break. Con Edison shut down steam to the nearby Lenox Hill Emergency Facility at 12th Street and Seventh Avenue as they worked on repairs, meaning the free-standing emergency room had water but not heat or hot water for some time, officials said. The shutdown did not affect any clinical operations. Several buildings on 13th Street between Sixth and Seventh avenues were also left without water Wednesday. Councilman Corey Johnson said not many more buildings were affected because it was a smaller main break and a number of buildings in the area have their own water towers. 7th and 13th filling with water! 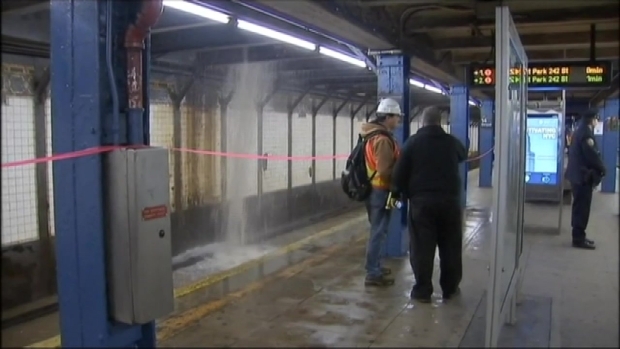 Major water main break at 14th street station. 1, 2, 3 shut down. Station filling with water, luckily we got out!